Tales from a tribble: Can This 'Today In Baseball History' Really Be Possible? Can This 'Today In Baseball History' Really Be Possible? I was watching the Houston Astros broadcast vs. the evil Texas Rangers on Wednesday night, June 14, 2017, and they showed a "Today In Baseball History" as they always do. They showed a stat that happened on June 14, 1974 that I find hard to believe. 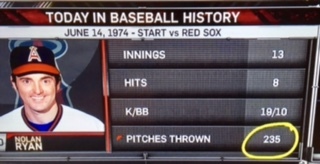 Nolan Ryan was pitching for the California Angels [now called the LA Angels of Anaheim] against the Boston Red Sox and look at this amazing "hard to believe" stat that is circled on the bottom of the following display. If this is true, Nolan Ryan [pitching in 13 innings] threw 235 pitches. Two hundred thirty five! Today if a starter would throw 235 pitches in two games, you would have to question if the manager is overworking them. I just have one word for what Nolan Ryan did on "today in baseball history": Wow!